09/28/2018 2:35 PM by Jacob C.
I had the pleasure of stopping by Mike & Maddy’s today. This was the first day of business for the new concept by owner Michael Calogerakis. 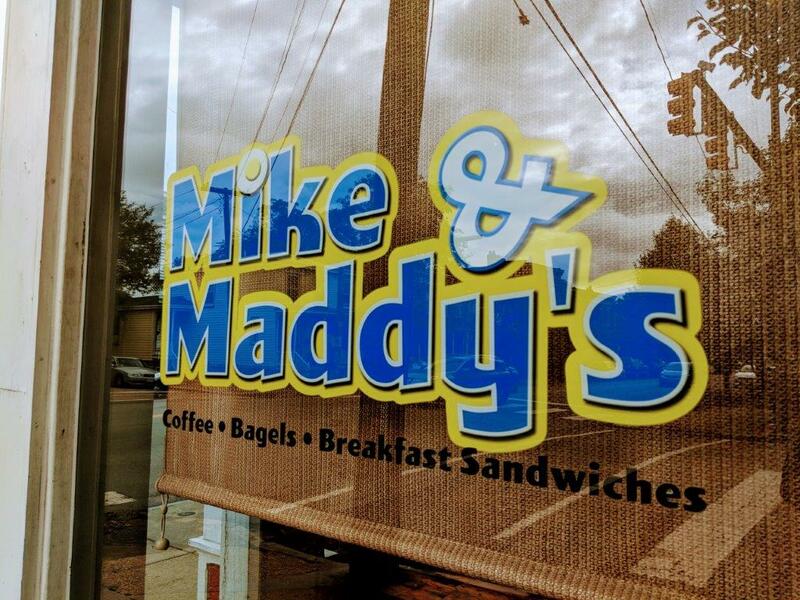 Mike & Maddy’s resides in the space formerly occupied by Anthony’s on the Hill at the corner of 29th & Broad St. I had a bagel sandwich called the Broad St BLT, amazing medium roast coffee, and I got to try a vegan muffin and some coffee cake. All of the food was incredible! This is something we don’t really have on the hill right now and it’s very affordable! 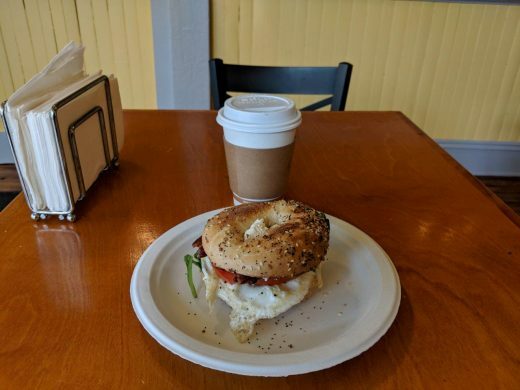 The muffins and cakes are made in-house, the bagels are from Cupertino’s Bagels in the west end, and they have a whole list of locally sourced ingredients. The fare is breakfast oriented with bagels, smears, and breakfast sandwiches. Michael told me that the menu will change and evolve as he learns more about what customers are looking for. I also had to ask about the name Mike and Maddy’s while I was there. The Mike is obvious but he shared with me that Maddy is his daughter. She helped him design the logo and contributed to the concept and some menu ideas. 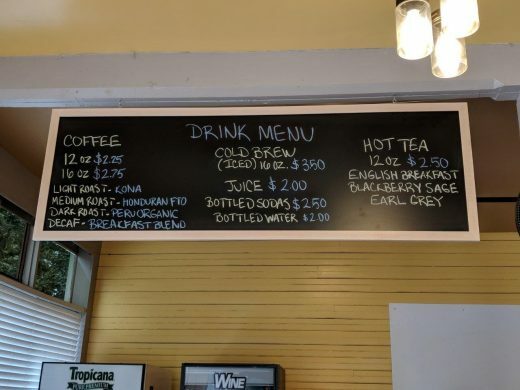 Michael also shared with me that his entire team had a part in the menu and picking what they’re serving so hopefully it has a little bit for everyone. I definitely came away impressed by the quality of everything I had at Mike and Maddy’s and definitely recommend you stop by. It would be cool if they made pizza. Theres enough pizza places thank goodness for something different!! So excited for a breakfast spot on our block, welcome!! I know some people were sad about Anthony’s closing, but THIS LOOKS AMAZING! Cupertinos bagels are the best in town, and I love love love breakfast bagel sandwiches 🙂 So excited! We definitely didn’t have something like this yet in Church Hill and I will be stopping by often on the weekends, esp. when I have guests! I wish them the best of luck! I’m also dismayed to see the disposable products in the photos with this article. Would love to see traditional reusable restaurant dishes — as well as more of a sit-down, dine in menu, like good old eggs, toast and potatoes, etc. We can already get good egg sandwiches and muffins around the corner. Can we get the eggs and such without the bread for us keto types? Why is everything in Church Hill closed on Mondays? Menu item says “churchill” is it named after something other than our neighborhood? Exciting news tho. Good to see they have reopened, hopefully they will add some good omelets to the menu. Not a bread person. Meh. Pizza was better. This seems wasteful and the selection is limited. 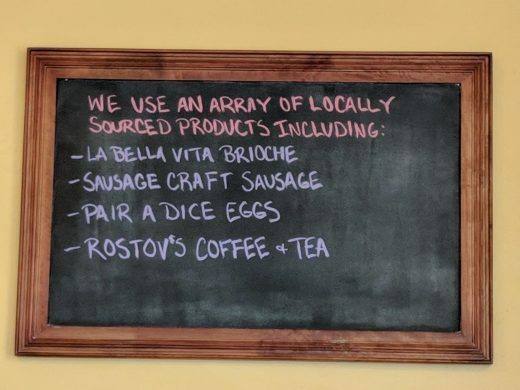 Just want a ham egg and cheese..
Glad to see bagels join the pie place, the muffin and biscuit place (WPA), and the pasty and bread place (Sub Rosa) as Church Hill baked options. Still a bit sad to lose one of the only neighborhood delivery options for dinner though. We weren’t fans of their pizza but we LOVE a good breakfast. ??? Hope they have much success. ? Okay everybody that’s it. We need to close this place up since it doesn’t cater exactly to Mark’s preference of ham egg and cheese and nothing else. Although I’m willing to bet he likes some whine with that. Completely agree that lower carb options would be a huge addition to the neighborhood – tired of cooking eggs at home. A breakfast option in Churchill?!?! What a refreshing idea!!! Had their “Old School” sandwich yesterday. Soft toasted brioche, perfectly cooked egg, cheddar cheese, crispy bacon with a maple aoili. A fantastic sandwich. Rostovs dark brew was a bit too light/weak for my needs ( i need a little punch in the mouth by my coffee). All in all, a good visit. Reading these comments is a constant reminder of how privileged our neighborhood is becoming. Sometimes a business chooses to reinvent itself because they are passionate about something. As a neighborhood that prides themselves on community and supporting local business we should uplift new business not make judgement without even trying it. “Meh. Pizza was better. This seems wasteful and the selection is limited. Just want a ham egg and cheese..” You know a great idea to get a ham, egg, and cheese? Go in and buy something else you might like and maybe ask them if it’s something they could maybe do a special on? Turns out that a local business might actually listen to recommendations if you are an ACTUAL customer. Also starting with a limited menu is the right way to do it. It’s more approachable and it helps them keep costs lower in the beginning. This is probably the reason for those “disposable products”. Having a short order kitchen for a neighborhood full of picky eaters can be a cumbersome and expensive undertaking. You have to start somewhere. “We definitely didn’t have something like this yet in Church Hill,” someone said. Did everyone forget Captain Buzzy’s is literally right down the street with a bigger menu and that there are no other GOOD pizza places nearby? Agree with K. Cut them some slack. 8 1/2 has good pizza. Also if you are willing to use Grubhub or Uber eats there are over 10 Pizza places that deliver and the majority are locally owned and operated. That includes pizza from Triple Crossing Fulton. I’d venture to say it’s not an issue of availability but taste. Added menu item: Punch in the morning–locally sourced by cashier. WHAM! 8 1/2 has horrible pizza… all bread, no toppings, soggy, and we need pepperoni. I am a New York kind of pizza guy (thin crust with lots of cheese and meat). Anthony’s did have good pizza. I am more of a Blue Plate traditionalist when it comes to breakfast (think Cracker Barrel). Hoping they will expand their fare to include cook to order eggs, grits, hash browns, buttermilk biscuits, etc… and not just bagels or gluten-free sandwiches 🙂 Was hoping for more of a “3rd Street Diner” sit and eat concept here in Church Hill instead of grab and go. Congratulations to M&M. A really nice addition to the hood. Good sandwiches, nice crew and a great way to start the day. Try it out – you’ll meet your friends. Eric Huffstutler, I have to agree. The dough is not right at 8 1/2. It is missing something, maybe salt? I dont know, but the crust is bland, the toppings do not excite me, and it is super expensive. 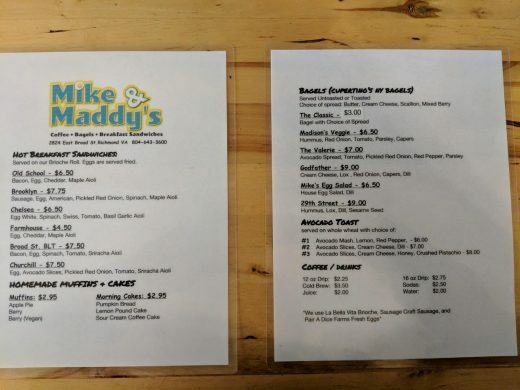 Have not tried Mike and Maddy’s, but I am excited.